He was the grandfather of William the Conqueror and as duke ruled Normandy from 996 to 1026. Richard’s son Richard III (the Conqueror’s uncle) is included in this post since he ruled only from 1026 to 1027, about twelve months. Let’s begin with genealogical tables to get the big picture. It is difficult to find basic facts and stories about the early House of Normandy. Here is the best I could scrape together. It is important to realize that France as we know it today was not even close to being unified in the Medieval Age. It was in the process of breaking up into a patchwork of duchies and counties, overseen by dukes and counts. They tirelessly competed with each other. The vast majority of Normans was Christian and French-speaking and was hurrying to lose its Viking identity. Exotic Scandinavian names were disappearing. However, Rouen, the capital of Normandy, was about to be invaded by Vikings interested in trading their plunder from weak England. Richard II in his later years commissioned Dudo of St. Quentin, who wrote a history of these Normans all the way back to Rolf / Rollo, the lead Viking. Dudo was on a mission to make his subjects look good—too good. His goal was to legitimize the early Normans, saying they were not just Viking plunderers. Sometime in the course of Richard’s reign over Normandy he referred to himself as duke. As noted, England in the 980s was weak so the Vikings raided the coast and then found buyers of their plunder among the Normans. Viking ships clogged the harbors. The English king Æthelred (the misnamed Unready, since his old English name meant Noble Counsel) protested to the pope, and on Christmas day 991 a papal envoy arrived to negotiate with Richard I (Richard II’s father), to stop trading with the invaders, including slaves. 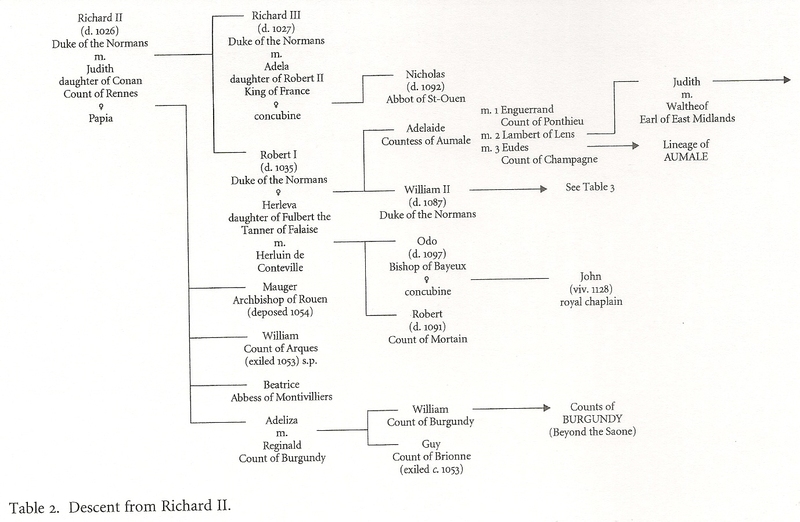 Richard II succeeded his father in 996. A huge army of Vikings invaded Wessex and pillaged it, province by province, from 997-1000, so any agreement between Æthelred and Richard I was forgotten. It is probable that Richard II figured: Better the English than the Normans to suffer invasions. Æthelred sent a big bribe to the Danes around 1000-1001. But Æthelred married Richard’s sister Emma in spring 1002. Æthelred committed a big blunder by massacring Danes who settled in the southeast of England in November 1002. Now King Swein of Denmark into England and intensified the invasions more in England than elsewhere, like the Baltic. In 1003, a large Norman force jointed King Robert II’s invasion of Burgundy, who claimed Burgundy himself, as duke. The king secured the duchy in 1005. In about 1003 (or earlier), Richard looked to his own borders by marrying Judith, sister of Count Geoffrey of Brittany, who was married to Richard’s sister Hawise. Richard married Judith in a church ceremony at the abbey of Mont St. Michel on the Norman Breton border. He created a buffer zone against his enemies the counts of Blois-Chartres and the counts of Anjou. In about 1006, Richard married off his daughter Adelaide, still a child (these marriages were not consummated until much later), to Count Reginald of Burgundy (who ruled the part of Burgundy across the Saone). Then when Count Reginald was captured by his rival, Count-Bishop of Chalon, Richard sent his son Richard III and liberated him. From about 1008-1009, Æthelred decided to invade northern Normandy (Contentin), intending Lower Normandy, but this ended in disaster. By 1010 at least, Richard was operating a system of administration in his duchy of Normandy. Each pagus (pagi, where French gets its name pays or country) or comitatus was overseen by a viscount (vice-count), a title appearing in the times of the Carolingians. These titles appear in the records: Chamberlain, usher, clerks, a notary, chancellor and chaplains, before his death in 1026. By 1013, Richard’s prestige was high, and he welcomed King Swein into Rouen. Apparently the Normans, whose name comes from Northmen, still felt connected to Denmark and Norway. Richard even hired Viking mercenaries to wage a border with Odo II (Eudes), count of Blois (d. 1037), with the support of Olaf Haraldsson (later king of Norway). Æthelred died in 1016, and Richard’s sister Emma married Cnut of Denmark. At Fécamp in 1025, a dual act referred to Richard’s two heirs, Richard and Robert. Richard II fell ill and died on 23 Aug 1026 at his beloved Fécamp. His sons Richard and Robert were adults. Richard succeeded, and had a son and two daughters by a concubine, but Robert did not like it. Richard was a warrior, while Robert was settled in the town of Exmes and its dependent pays Hièmois. Robert defied his brother and formed an army to revolt, causing damage in the diocese of Bayeux, where his cousin, the bishop, lived. Robert wanted to control the fortress of Falaise in the Hièmois, which Richard had retained and seized. Warrior Richard was more than a match for Robert, and Falaise was scientifically reduced by the siege engines. Robert had to acknowledge his brother’s authority, by kneeling before him and placing his hands in Richard’s. In January 1027, Richard arranged a marriage with Adela, infant daughter of King Robert, who was dowered with a wealthy settlement, including the county and city of Coutances. However, the poison accusation was usually false. Medieval chroniclers and historians did not want to name death from the judgment of God on a leader. Nonetheless, Richard probably died of disease. 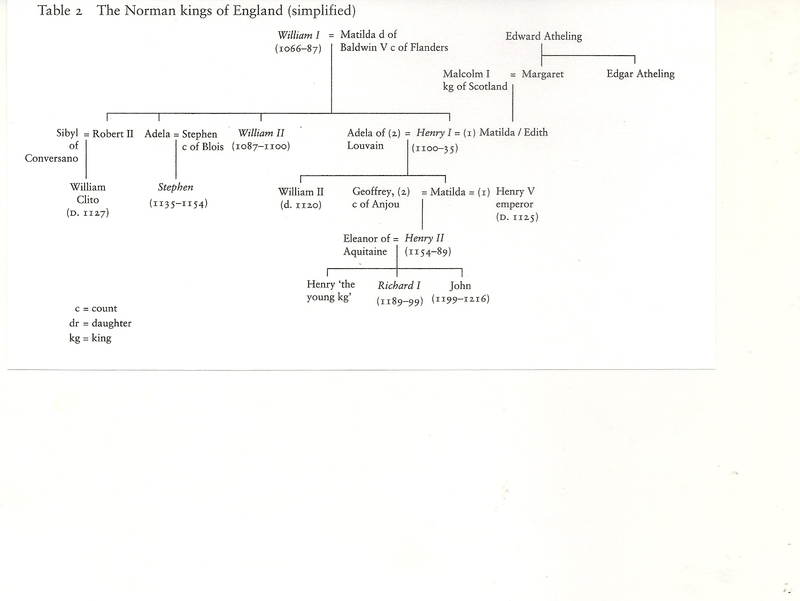 If Richard had lived ten more years, then his son Nicholas would have inherited (Chibnall says he “almost certainly illegitimate”) But now the duchy of Normandy went to Robert, William (the Conqueror’s) father. Judith of Brittany and Richard married before 1008. He was the Duke of the Normans, son and heir of Richard I, Count of Rouen and Marquis of the Normans, by his second wife Gunnor. Guillaume (William), monk at Fécamp. Judith died 28 June 1017 and was buried in Bernai Abbey. Guillaume (William), Count of Arques. 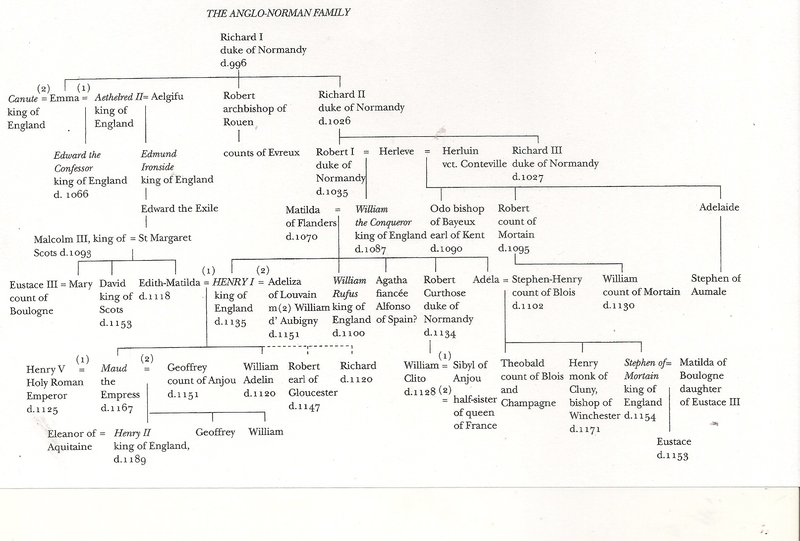 And according to Crouch’s Genealogical Table, Richard and his wife or mistress also had Adeliza, who married Reginald, Count of Burgundy. Richard II died at Fécamp 23 Aug 1026. 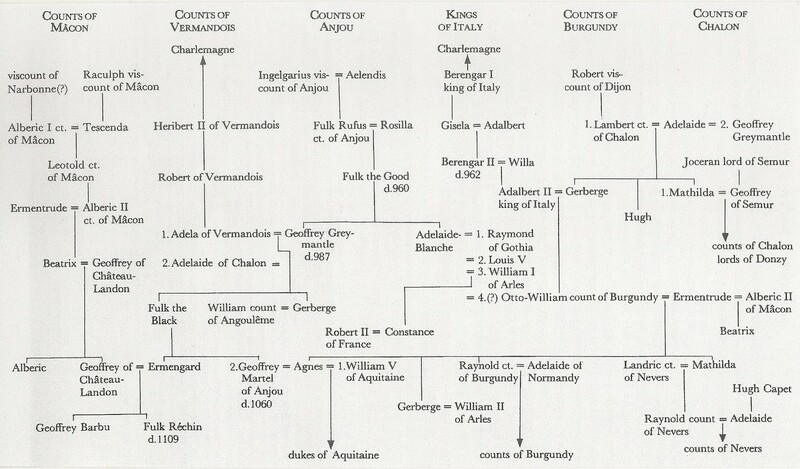 Here is an excerpt from Medievalist Marjorie Chibnall on Richard II’s family expansions and marriage alliances. From the beginning of his reign, Richard II was helped by his uncle, Raoul [Ralph] of Ivry, the half-brother of Richard I; and from 1010 he used his ducal status to nominate other kinsfolk as counts under himself. 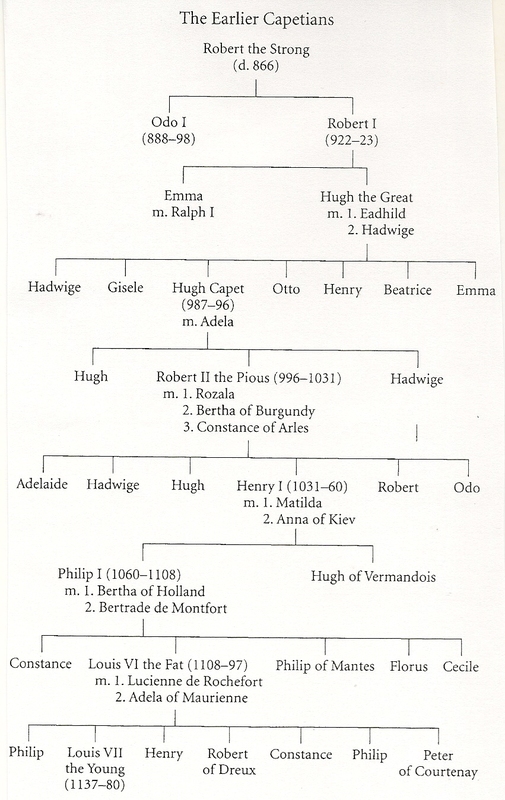 His brother Mauger became count of Corbeil; and his half-brothers, William was made count of Eu, and Godfrey’s son Gilbert of Brionne, was in time given the title of count. His brother Robert, archbishop of Rouen, fathered Richard, later count of Evreux. Two of the sons of Raoul of Ivry became bishops: Hugh of Bayeux and John of Avranches; his daughter Emma married Osbern the steward, a nephew of the duchess Gunnor and later the devoted guardian of the young Duke William [future Conqueror and king]. Jim Bradbury, The Capetians: Kings of France (Continuum, 2007). Marjorie Chibnall, The Normans (Blackwell, 2000, 2006). 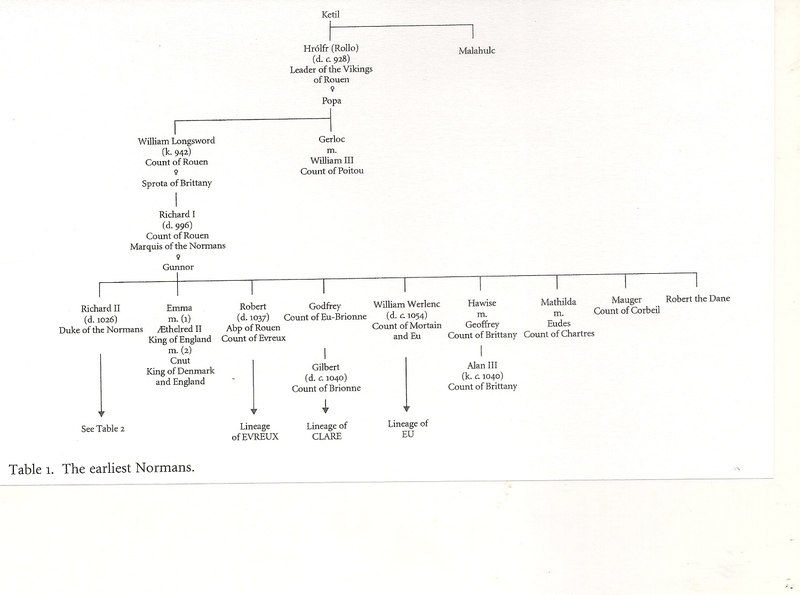 David Crouch, The Normans: The History of a Dynasty (Hambledon and London, 2002). Ian Crofton, The Kings and Queens of England (New York: Metro Books, 2006). David C. Douglas, William the Conqueror: The Norman Impact upon England (UC P, 1964). Ivan Gobry, Robert II: Fils de Hughes Capet, Histoire des Rois de France (Pygmalion, 2005). John Le Patourel, Norman Barons (The Historical Association, Hastings and Bexhill Branch, 1966). —, The Norman Empire (Oxford: Clarendon P, 1976, and special edition for Sandpiper Books, 1997). Medieval France: An Encyclopedia, eds. William W. Kibler and Grover A. Zinn (New York: Garland, 1995). Charles Philips, The Illustrated Encyclopedia of Royal Britain (New York: Metro Books, 2009). 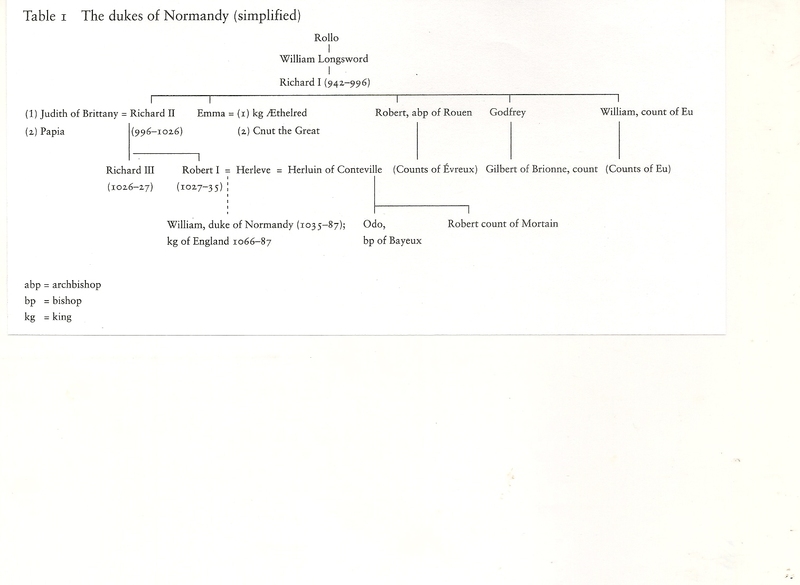 This entry was posted in Family History, Royal History and tagged Children of Richard II duke of Normandy, Genealogical tables of Richard II duke of Normandy, Richard II Duke of Normandy by james malcolm. Bookmark the permalink.